Born in Mendoza/Argentina, Veronica Cangemi was first cellist of the Mendoza Symphony Orchestra before winning the first prize at the National Singing Contest in Argentina. 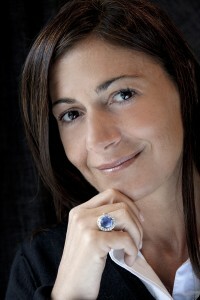 Veronica Cangemi then started her career in Europe singing ARMIDE by Gluck with Marc Minkowski and Les Musiciens Du Louvre in Versailles, HÄNSEL UND GRETEL at Radio France. She continued with Zerlina in DON GIOVANNI and Pamina in DIE ZAUBERFLÖTE at the Teatro Colon in Buenos Aires, Despina in COSI FAN TUTTE and LES PELERINS DE LA MECQUE in Montpellier with William Christie, OMBRA FELICE at the Salzburg Mozart Festwochen and at the Paris Théâtre des Champs-Elysees, Susanna in LE NOZZE DI FIGARO and Adina in L’ELISIR D’AMORE as part of the ensemble of the Opera National de Lyon. She also sang Servilia in LA , CLEMENZA DI TITO in Glyndebourne with Sir Neville Marriner, Zerlina and Dardane in Haydn’s L’INCONTRO IMPROVVISO at the Bordeaux Opera, Rameau’s PLATEE at the Lisbon Festival, Emilia in Vivaldi’s CATONE IN UTTICA in Tourcoing. Ilia in IDOMENEO with Marc Minkowski at the Flanders Opera and at the Lyon National Opera, Monteverdi’s ORFEO with Il Giardino Armonico at the Graz Festival, her first Poppea in L’INCORONAZIONE DI POPPEA at the Teatro Comunale di Firenze, and Dalinda in ARIODANTE at the Bavarian State Opera followed. She interpreted the title role of Scarlatti’s LA GRISELDA at the Innsbruck Festival and at the Berlin Deutsche Staatsoper, CELOS AÙN DEL AIRE MATAN (a Spanish baroque opera) at the Teatro Real in Madrid, again Emilia in CATONE IN UTTICA at the Paris Opéra Comique with Jean-Claude Malgoire, JUDITHA TRIOMPHANS at the Montreux Festival, Armida in RINALDO at the Bavarian State Opera, the title role in a new production of IPHIGENIE EN AULIDE in Glyndebourne, and the title part of Mozart’s ZAIDE at the Lufthansa Festival in London. In concert, Veronica Cangemi performed Mahler’s SYMPHONY N°4 on tour with Jean-Claude Casadesus and the Orchestre National de Lille, Marek Janowski and the Deutsche Symphonie Orchester in Berlin and the Orchestre Philharmonique de Radio France, Louis Langree and the Orchestre de Picardie. She co-operated with Heinrich Schiff at the Winterthur Festival, Thomas Hengelbrock at the Würzburg Festival, Marc Minkowski and Les Musiciens du Louvre, William Christie and Les Arts Florissants, Jean-Claude Malgoire and La Grande Ecurie et la Chambre du Roy, Giovanni Antonini and Il Giardino Armonico, Sir Neville Marriner, Ivor Bolton, the Netherlands Radio Philharmonic Orchestra at the Amsterdam Concertgebouw, the Sixteen Orchestra on tour in Spain, the Freiburger Barockorchester and René Jacobs, and the Amsterdam Baroque Orchestra and Ton Koopman in Cagliari. Among her projects for 2002 and 2003 were Zerlina in DON GIOVANNI at the Lacoste Festival, Servilia in LA CLEMENZA DI TITO with Ivor Bolton in Florence, as well as RINALDO (Armida and First Siren) and XERXES (Atalanta) at the Bavarian State Opera Munich. She recorded a Vivaldi solo album with the Ensemble Matheus conducted by Jean-Christophe Spinosi for Opus 111, as well as LA GRISELDA by Scarlatti with René Jacobs for Harmonia Mundi. Furthermore, she appeared in concert performances of Monteverdi’s L’ORFEO in Munich with the Bayerischer Rundfunk, concerts with the Berlin Philharmonic Orchestra (Fauré’s REQUIEM/Marc Minkowski) and at the Venice Teatro La Fenice with concerts of Beethoven’s CHRISTUS AM ÖLBERG (Marc Minkowski). Trevor Pinnock engaged her for Handel’s LA RESURREZIONE in London. In the season 2003/2004 she sang Ilia at the Teatro Comunale di Firenze and returned to the Bavarian State Opera for XERXES (Atalanta), ARIODANTE (Dalinda) and COSI FAN TUTTE (Despina). For the season opening of Teatro La Fenice she performed the role of Angele in a new production of DOMINO NOIR – conductor: Marc Minkowski . Ivor Bolton invited her for concerts of LA SENNA FESTEGGIANTE with the Freiburger Barock orchestra. In 2004/2005 she sang Marzelline/FIDELIO for the first time at the opera of Rome. She made another role debut in the part of Ginevra/ARIODANTE at the Bavarian State Opera and sings the role of Morgana in the new production of ALCINA , also at the Bavarian State Opera (with Vesselina Kasarova). M° Zubin Mehta invited her for a production of DON GIOVANNI / (Zerlina) in Florence, at Salzburg Festival she partecipates in a concert, conducted by M° Minkowski. Veronica Cangemi started the season 2005/06 with her debut as Contessa/NOZZE DI FIGARO at the Théâtre des Champs-Elyseés in Paris, followed by a recording of a Händel project with Alan Curtis, concerts with the Ensemble Matheus with M° Spinosi. She returned to Munich for revivals of XERXES/Romilda and RINALDO/Armida . The artist had her debut at Zürich’s Opernhaus with IL TRIONFO DEL TEMPO E DEL DISINGANNO/Bellezza and performed the role of Lucio Cinna/LUCIO SILLA at Teatro La Fenice, a production which is shown also at Salzburg Festival. Also at the Salzburg Festival she took over the role of Servilia/CLEMENZA DI TITO under the baton of M° Harnoncourt . conducted by René Jacobs, director: Christoph Loy. She earns a huge personal success in this role. M° Adam Fischer has invited her for Mozart concerts at the Würzburg Festival. She finishes the season with a concert tour with René Jacobs and performances of ALCINA and COSI FAN TUTTE during the July Festival at Munich’s State Opera. The season 2007/08 brings her debut in the USA – Veronica Cangemi participates in the ARIODANTE production of San Francisco’s Opera House. She also appears as Ismene/MITRIDATE at Bruxelles La Monnaie, in concerts with Ensemble Matheus (LA FIDA NINFA), concerts with Adam Fischer in Spain (Haydn’s CREATION) and Budapest, concerts with Jean-Christophe Spinosi in Edinburgh and Toulouse. At Dresden’s State Opera she will have her debut as Musetta/ LA BOHEME. together with Vesselina Kasarova, followed by a production of MESSIAH in Nancy with Jean-Christophe Spinosi. Under the baton of M° Claudio Abbado she sang a concert with a Pergolesi program, recorded by Deutsche Grammophon. Season 2009/10: concerts of ARMIDA (role debut) and Handel’s EZIO, a production of AGRIPPINA (role debut Poppea) at the Teatro La Fenice, followed by a production of ARIODANTE (Ginevra) in Oviedo, revival of DON GIOVANNI at La Scala, a production of NOZZE DI FIGARO (Susanna) at Washington Opera and a concert tour with Giardino Armonico. Season 2010/11: Veronica Cangemi appears in a new production of ALCINA at Vienna’s State Opera, at the Innsbruck Festival with OTTONE IN VILLA, a new production of ANTIGONA (title role) at Berlin’s State Opera, conductor René Jacobs), at the Theatre des Champs-Elyseés with ORLANDO FURIOSO (Angelica), and with the same piece at Nice and Nancy Opera, in Budapest and at the Barbican in London as well as numerous concerts. Season 2011/12: revival of ALCINA at Vienna’s State Opera, at New National Theatre in Tokyo the role debut of Mimi (LA BOHEME), a new production of DEIDAMIA at Amsterdam’s Opera House and concerts with Ensemble Matheus, at the Festival Baden-Baden, at the Vienna Konzerthaus “Alfons und Estrella” with Ivor Bolton, Händel’s PORO with Baseler Kammerorchester, at the Salzburg Festival “Die Schuldigkeit des ersten Gebots”, again with M° Bolton and the Mozarteum Orchestra, to mention only a few. production COSI FAN TUTTE at the Teatro Petruzzelli in Bari, concerts at New York’s Carnegie Hall with Ensemble Matheus and in Budapest with Budapest Festival Orchestra to mention only a few. Saison 2013/14: production of ORLANDO with Ensemble Matheus in Toulouse, Rennes, her debut at the Royal Opera House Covent Garden London with CARMEN/Micaela, several concerts throughout Europe, a production of IDOMENEO at the Teatro Colon, Buenos Aires. “Diapason d’Or of the Year 2006”.